← Younger Son sends photos. Row 1: *K4, sl1 with yarn in back. * Repeat around. Row 2 & 3: K around. Those slip stitches caused the sock to pull it a bit and become too tight, so I had to rip out about four inches of sock and start over with 66 st instead of my usual 60. Don’t ask me how my five-stitch repeat somehow worked with 66 st; either I actually had 65 st, or the pattern was K5, sl1. I don’t remember. Both were knit according to my standard Wendy’s Generic Toe Up Sock pattern, with the above-noted variation. 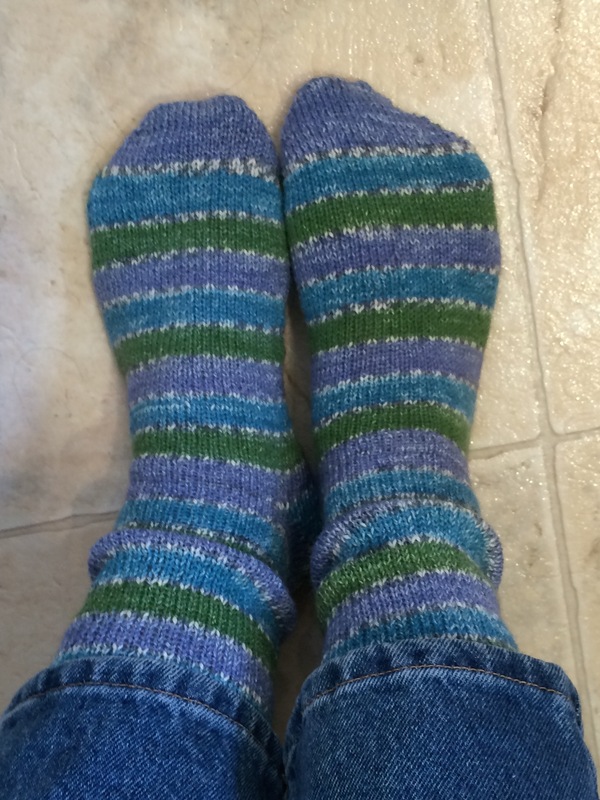 Plymouth Socketta is 45% cotton / 40% wool / 15% nylon. Although the wool should give the yarn some elasticity and softness, such qualities were hard to discern. I hated knitting the pair on the left; the other pair, for some unknown reason, not so much. Maybe it was because I knew what to expect, maybe it was because there was no pattern stitch. Anyway, I have one more skein of a similar yarn in the stash. It will be awhile before I cast on for those socks. [digression] Anyone else ever attempt to put multiple images in a row on WordPress? It was darned near impossible not as easy as I expected. I googled for ideas (Google is my BFF!) and found a gazillion people asking the same question. Eventually I created a table — I had to copy the html from the place where I found the instruction, and it still took way longer than it should have — and that more-or-less worked. I had to resize the images manually, and I see in Preview that they are not quite lined up horizontally, but at this point I just.do.not.care. 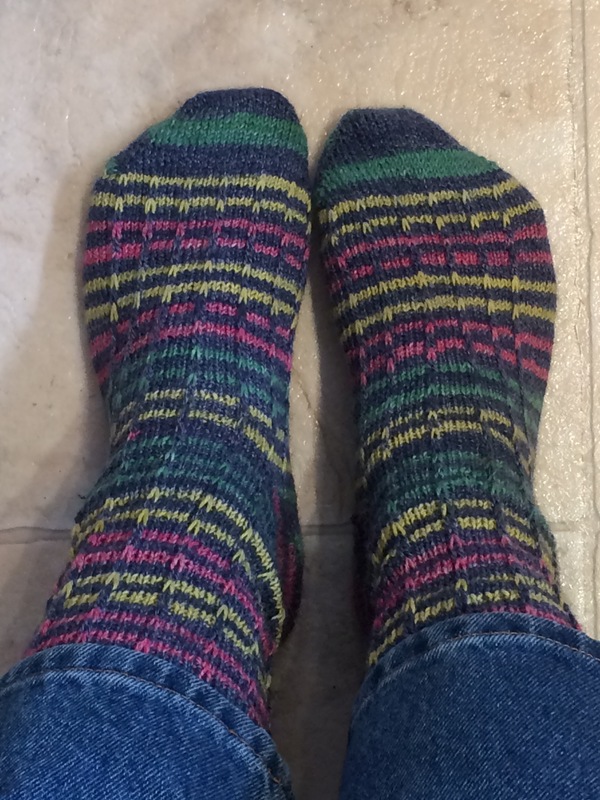 This entry was posted in FO, Socks, Technology and The Kat, Web/Tech. Bookmark the permalink.